If you're unfortunate enough to have read our previous AMD related reviews, you must surely know by now that one of the major advantages of opting for an AMD Athlon II/Phenom II based machine is it's attractive ownership costs. This of course is a selling point that is slowly being compromised by Intel's new "Lynnfield" Core i5/i7 LGA1156 processors, which are currently nipping at AMD's top end and soon enough there will be official responses to the value for money AMD Athlon II X2 and Phenom II X2 variants as well. Regardless of this however, the main reason as to how AMD carries this advantage is down to the price of motherboards. Yes, it is also possible to spend as much as £150 on a Socket AM3 motherboard but what we're trying to imply is that for most situations, even a more modest solution would suffice. "Really? ", You might be enquiring. After all, cheaper motherboards are likely to have weaker power regulation components, will lack important features and more importantly might not overclock as well. While often true, one could not blindly apply this to every circumstance and I can bet and tell you that such an attitude may offer no gains and a wallet that's a little lighter than it could've been. Today we intend on showing you all a motherboard that may just offer the best of both worlds, the Gigabyte MA770T UD3P. Gigabyte obviously does not need much of an introduction as it is a very well established brand and has had it's fair share of popular motherboard releases. The manufacturer currently has a very wide variety of AMD Socket AM3 motherboards and this particular model sits somewhere in the middle from the low end Micro ATX AMD 740G boards and the fully fledged CrossfireX compliant AMD 790FX boards. 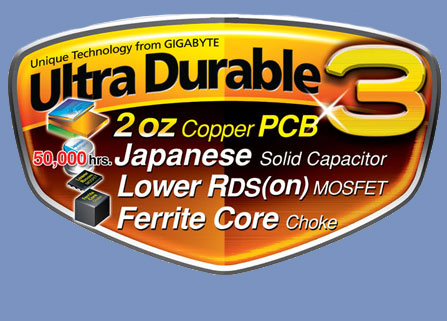 When many prospective customers are looking for performance without too many compromises and a good price to boot, it's crucial for motherboard manufacturers to find a means to offer that perfect bowl of porridge that's just right. One could call it the sweetspot. The focus of such a platform amongst the major motherboard manufacturers seems to have returned to one of the first AMD K10 Northbridges to be released in 2007, the AMD 770. It's a basic northbridge with a limited number of PCI-Express lanes but as such it's one that was cheap to start off with and still is. To those that hadn't looked into AMD Socket AM2+ / Phenom (65nm) motherboards, their achilles heel was it's overclocking performance as well as it's ancient SB600 Southbridge and it's less than steller I/O performance. With the introduction of SB700 and then SB710/SB750, the older AMD770 has been given a fresh lease of life and this is exactly what Gigabyte have done. The end result should be a board that allows AMD's processors and a wide variety of RAM, Hard Disk Drives and Graphics Cards to perform at their best. A fairly standard feature set but with the inclusion of a couple of key notes that hint that build quality has not been compromised such as Ultra Durable 3, it's CPU VRM power design, 100% solid caps and Dual BIOS protection. Please turn over to take a look at the motherboard in person.